An outstanding crunch, but a little in between the best of regular and the best of Kettle. They did not turn to mush, as many regular Chips do, but neither were they quite as rigid and crispy as Kettle. Still very good though. More thin than Tim's Cascade Chips, but just as thick as anyone else's Kettle Chips. There seemed to be a little more in the way of an oil bubbled textured surface to these Chips. Hawaiian Chips are cooked more slowly than many Kettle Chips so the potato slices clearly get the oil more slowly, so there is not such a made panic to escape (well, that's how we picture the oil working). The odd thing about these Chips was the yellow color was muted. In the right light you would swear they were green. Wasabi green? Well no, but they were definitely an odd shade of golden. 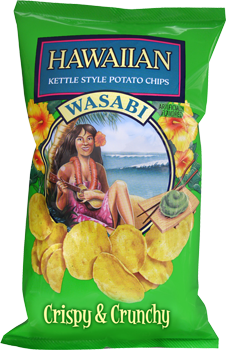 Of all Chips bags in all the world, why did Wasabi have to turn up in ours? The Japanese horseradish style green muck makes eyes water more easily than hotter sauces. These Chips however, provided us with a flavoring. We have all been there... A roll of Sushi, a big dollop of Wasabi... And the taste? Dunno, just tasted Wasabi! These mixed the potato up well, but we would have preferred, as with the Mango & Habanero flavor, that it was blended in a combo with a fruit or something sweet.